Walker Fowler grabbed an extra $250 after jumping off the line first for the Wiseco Holeshot award. 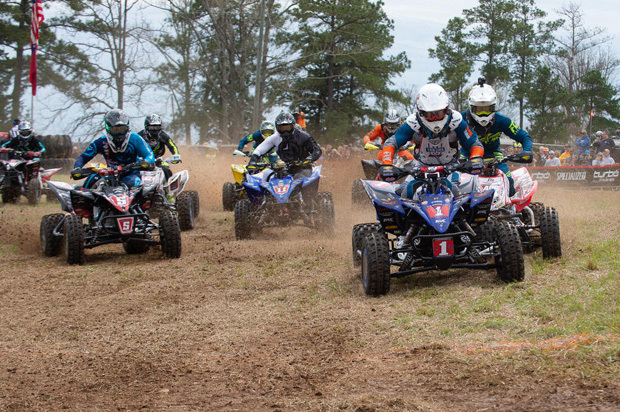 WASHINGTON, Ga. (March 17, 2019) – This AMSOIL Grand National Cross Country (GNCC) Series presented by Specialized, an AMA National Championship, headed to Georgia for The Specialized General GNCC. 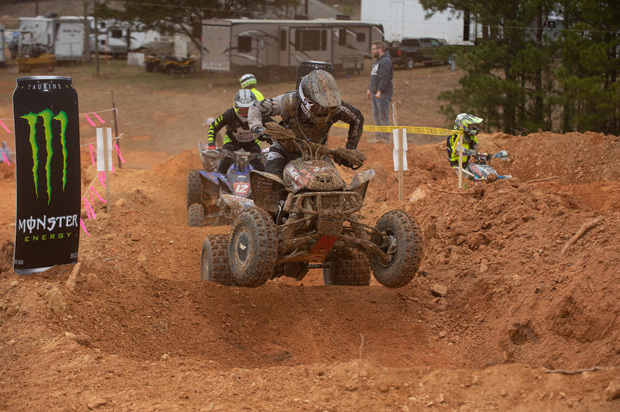 WFR/GBC/Fly Racing/Yamaha’s Walker Fowler jumped out to the early lead, grabbing the $250 Wiseco XC1 holeshot award. As the race wore on Fowler would continue to hold the lead position, ultimately earning his second-straight win of the season. OBOR/Moose Racing/Parts Unlimited/McGill Mafia’s Adam McGill came through mid-pack on the opening lap, however McGill would put his head down and focus on the remaining laps working his way up to the second place position. McGill would have his work cut out for him after engaging in several battles before finishing 0.987 seconds ahead of Maxxis/Fly Racing/Ye Olde Cycle Barn’s Chris Borich. Borich rounded out The Specialized GNCC overall podium after a last lap push put him in contention from his fifth place standing. After two rounds Borich sits fourth in points, but sits only one point behind second and third, who are tied in the standings. After coming in second last weekend, Yamaha/AmPro/Action Offroad/GBC’s Cole Richardson had another great ride, while battling at the front of the pack for majority of the race. Richardson would manage to finish the race in fourth, coming in just 1.08 seconds behind Borich. Jarrod McClure put in a hard fought battle throughout the two-hour race on Saturday, ultimately finishing in sixth overall. LanMills XC/CST Tires/Houser/Yamaha’s Brycen Neal steadily worked his way through the XC1 pack lap-by-lap. Neal, who earned his first-career overall win last year at this event, came through in fifth overall on Saturday, March 16. JMR/Maxxis/Elka/Moose Racing’s Jarrod McClure finished seven seconds behind Neal in sixth overall after putting in a hard fought battle. This weekend, Maxxis/Ithaca Recreation Sports/Fly Racing’s Hunter Hart managed to work his way to the fourth overall position, before falling back to seventh overall. Hart would make some minor miscalculations, but would pull off his second-straight top 10 finish in the XC1 Pro class. Ryland Johnson Racing/GBC Motorsports/ Ye Olde Cycle Barn’s Westley Wolfe worked his way up from a 10th place start, to an eighth overall finish on the day. 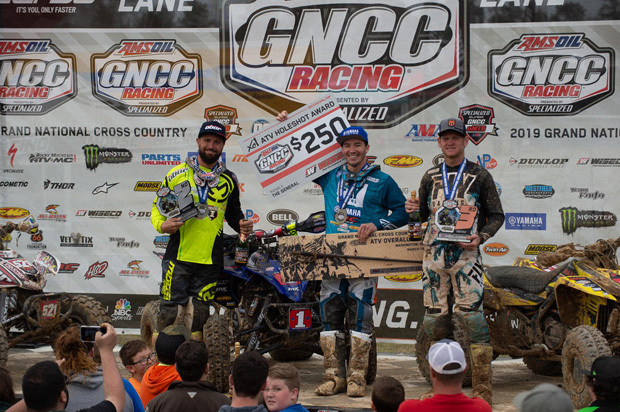 Walker Fowler (center), Adam McGill (left) and Chris Borich (right) made up the overall podium at The Specialized General GNCC. M.R. Unlimited/GBC Tires/RJR’s Devon Feehan started at the front of the pack, but would ultimately end up in the ninth place position as the two-hour race came to an end. GBC/Fly Racing/HMF/Yamaha’s Johnny Gallagher put in a great ride, rounding out the top 10 overall at this weekend’s Specialized General GNCC. In the XC2 Pro-Am class it was Pierce Performance/Maxxis/Waynesburg Yamaha’s John Glauda Jr. and LanMills XC/CST Tires/Moose Racing’s Drew Landers swapping the lead back and forth on the first couple of laps. However, Glauda Jr. would make the pass stick and hold onto his second-consecutive class win. Landers would finish out the day second in XC2 and 12th overall. Jordon Poplaski earned himself the $100 All Balls Racing XC2 holeshot award, evening rounding out the XC2 class podium. 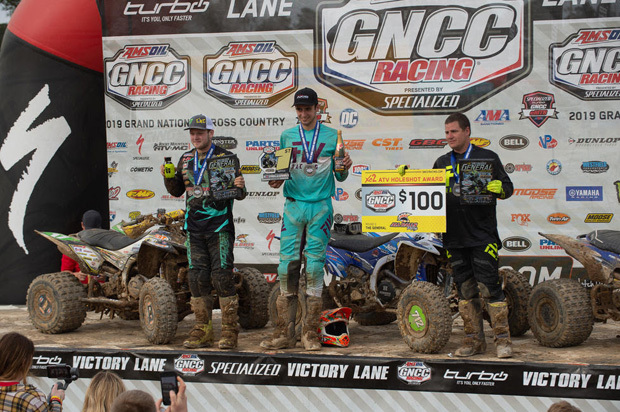 John Glauda Jr. (center), Drew Landers (left) and Jordon Poplaski (right) rounded out the XC2 Pro-Am podium. The Specialized General GNCC AMSOIL Moto Hero recipient was Ohio’s Erin Hendershot. 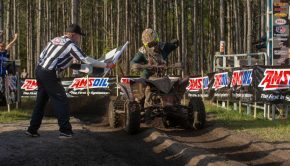 After missing the opening 2019 GNCC round, Hendershot returned on March 10 from deployment and set his sights on heading to the Georgia GNCC round. After receiving the nomination from Ashley Hendershot, and being chosen as Airman of the month in the Airforce where he is part of the 169th Airlift Squadron, AMSOIL and GBC Tires wanted to show their support to the Hendershot family. Erin won himself a $250 AMSOIL shopping spree, along with 4 GBC tires. To nominate someone you know, or yourself for the upcoming GNCC rounds, please click HERE. In the 10 a.m. race, it was Can-Am/OBOR Tires/Derisi Racing’s Landon Wolfe coming away with another overall victory as well as the 4×4 Pro class win. Wolfe would grab the holeshot and lead until the checkered flag flew. Coming in 21 seconds behind him was Can-Am’s Jordan Phillips followed by Can-Am’s Robbie Pecorari rounding out the 4×4 Pro podium. Erin Hendershot was awarded the AMSOIL Moto Hero Award in Georgia for his service in the Air Force. GBC Motorsports/Yamaha/Fly Racing’s Traci Pickens made her way to the center spot of the podium at the conclusion of this weekend’s 10 a.m. race. Action Offroad/Moose Racing/GBC Motorsports’ Katelyn Osburn earned the second place position, and continues to hold the points lead heading into round three. Honda’s Hannah Hunter earned her first-career WXC podium, coming through in the third place position. Layne McCormick came through in fifth overall, leading the way in the Schoolboy Sr. (14-17) class with James Glauda and Colton Buck rounding out the top three. 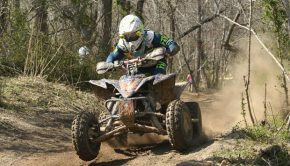 Micro 50cc ATV racing took off the line at 9:15, where Bodie Buckhannon came through in first overall, taking the MXC1 (8-9) class win. Ryder McCormick earned second overall and the 90 Stock (8-11) class win. West Virginia’s Garrett Cox came through third overall, taking second in the MXC1 (8-9) class. Bike micro 50cc racing was next up on the list, and saw Caleb Wood take the overall win and MXC1 (8-9) class win. Brian Poindexter and Colby Goodman came through in the second and third place positions. Nash Peerson rounded out the top five overall, and earned himself the MXC2 (6-8) class win. Dwight Pollard was off to a good start in the 4×4 Pro class, but it would be Landon Wolfe earning the overall win. The ATV Youth riders were the first to take off the line at 8 a.m. yesterday. Kentucky’s Damien Hawkins earned the youth overall win along with the YXC1 Super Mini Sr. (13-15) class victory. Parker Henderson and Paxton Dickerson would follow in second and third overall. Georgia native, Charlie Stewart earned the YXC2 Super Mini Jr. (12-13) class win, with Nicholas Dearing and Shayne Crull rounding out the top three. The first round of the Specialized Turbo eMTB GNCC National Championship Series took place yesterday. 2011 GNCC National Champion, Charlie Mullins came through in the number one position on lap one and did not look back. Mullins was on a mission, placing a four minute gap on the field by the time the checkered flag flew. Specialized’s Nat Ross earned the second place position in the XC1 Pro class followed by Idaho’s Kyle Warner rounding out the top three in the first-ever Specialized Turbo eMTB GNCC National Championship Series podium. 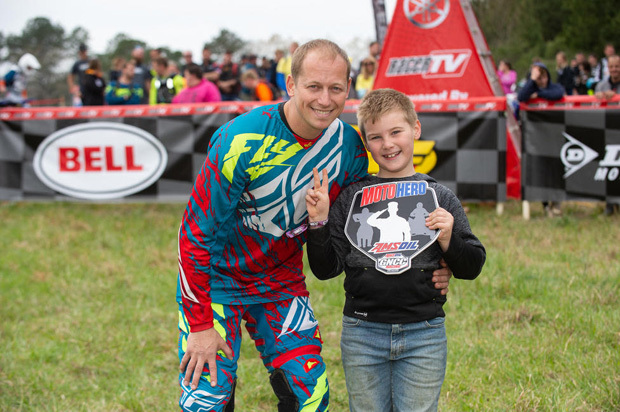 Charlie Mullins took the first Specialized Turbo eMTB GNCC National Championship victory. 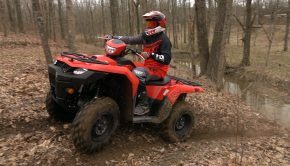 The 2 p.m. ATV Pro race was broadcast LIVE in its entirety on RacerTV.com and can be viewed as archived video online by visiting the GNCC LIVE page online. A highlight show featuring the event will be aired on the NBC Sports Network on Sunday, June 2 at 11:30 a.m. EST. 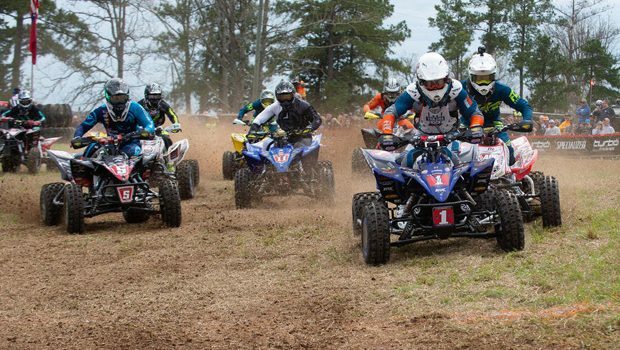 The 2019 GNCC Series returns in two weeks, March 30 and 31, with the FMF Steele Creek in Morganton, North Carolina. 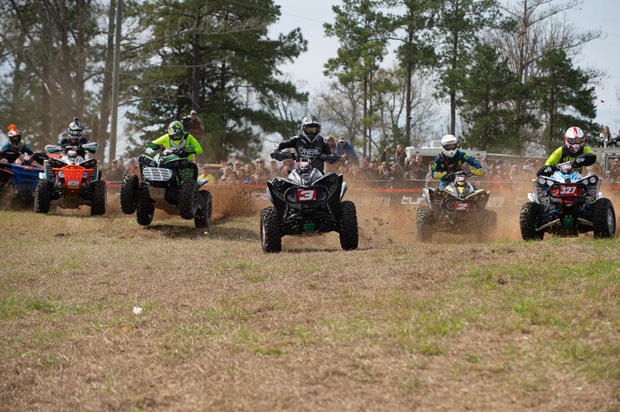 This event will also feature round two of the Specialized Turbo eMTB GNCC National Championship. The Specialized Turbo eMTB GNCC National Championship brings off-road racing and pedal-assist or electric bicycles together for an eight-round championship produced by Racer Productions. 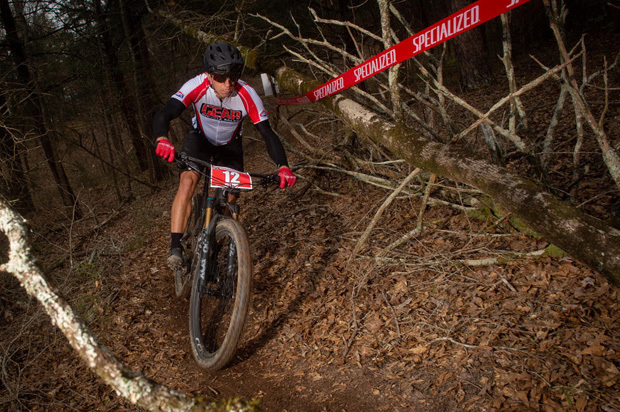 Much like a typical cross-country racing event, these races feature varied terrain featuring hills, rocks, roots, and more but are limited to electric, or pedal assist model mountain bikes only. For more information, please visit www.gnccracing.com.